Why do people leave their countries of birth to live here? What is their experience in their new country? How do communities adapt to new arrivals? These are the questions that the Immigration Museum poses. Expect a thought-provoking experience filled with stories that are sometimes sad, sometimes funny, but always compelling. And somewhere within, you’ll find your own story. 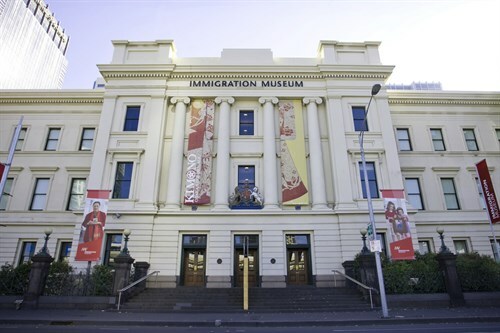 In 1998, the Immigration Museum opened in the beautifully restored Old Customs House. As the former administrative centre of Melbourne’s immigration and customs, it is the perfect home for a museum filled with the real stories of people who have migrated to Victoria. Today, you’ll find two floors of exhibition galleries that house temporary and permanent exhibitions. Several times a year in the festival courtyard we host joyous community festivals that are alive with food, music and culture. The immigration discovery centre is the perfect place to start your genealogical research, while the tribute garden is a beautiful sanctuary that honours immigrants from over 90 countries.